Time to cleanse your liver! 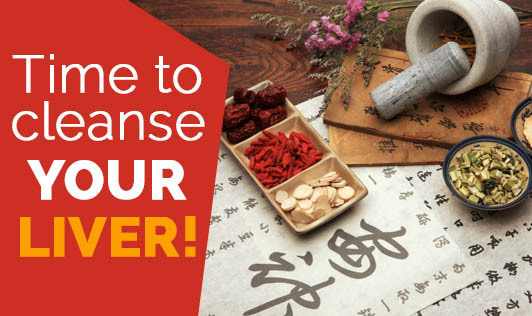 Did you know that in Traditional Chinese Medicine it is said that most of our organs are connected to a specific emotion? You heard that right! And, your liver is the organ that is connected to "ANGER". All emotions have a basis in our biochemistry. When we feel angry, this transforms into a multifaceted mixture of hormones and other chemicals, which travel to various parts of the body, to ready it for action. Hence, fear, joy, jealousy- all these emotions can have a profound effect on our body, depending upon the duration and strength of the emotion. Anger causes the liver's energy flow to be blocked. If pronounced enough, this congestion causes a sensation of heat that rises up to the head, often showing up as a red face and blood shot eyes. Most of us are unaware of this correlation that exists between anger and the effect that it has on the liver because we don't understand the depth of the connection. The liver is a prime detoxification organ; hence it is the main organ that is accountable for handling all of the chemicals coming into the body. When the liver is overloaded, increased amounts of toxins circulate throughout the blood affecting most of our body systems. Our livers must transform the excess hormones released during emotional states.. However, if the liver is not functioning properly, emotional states that should come and go, stay for longer than necessary. While emotions can have an effect on the liver, the reverse is also true. In this 21st century, with our diets and lifestyles, a majority of the people's livers have become large storage sites for toxins. Such a build up of toxins can eventually lead to anger problems, and affects people who have issues with controlling or letting go of anger. The effect on the liver, and hence, your emotion also depends on how toxic the individual's habits are such as smoking, drugs, alcohol and intake of excess processed food. When our environment is filled with so many factors that can affect our emotions, we should know that this puts a burden on the liver too. The liver, being the seat of anger, needs to be detoxified and relieved of the anger stored in it. Hence, It's time to for us to make the change right now!